Yesterday’s patch brought back the Jade Forest, and with it the Cloud Serpent faction. All of the tradeskills are in place now too. I’ll have more about those later. 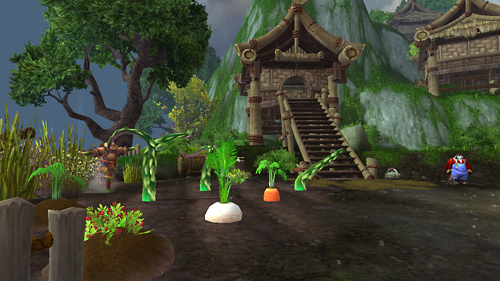 The patch also brought us the first public beta iteration of farming and the Tillers faction. MMO-Champion has already done a bang up job with their beginner’s guide to farming. So if you’re looking to get started that’s a good place to go. One of the things about farming in MoP that I really enjoy (when it works) is dealing with the kinds of seedlings that you’ll get after planting a seed. For instance, you’ll sometimes get Wiggling plants, or Wild plants, or infested plants. There’s a whole list of possibilities and each one takes a different action to correct the problem and get your plants back to growing correctly. I think it’s fun to try and figure out what needs to be done on my own. But admittedly sometimes that takes a while. If you get stumped you can always ask your buddy Farmer Yoon who will tell you what his Grandfather used to do in situations just like this. As of the current build(15913) Wild plants are bugged. You can see them in the picture above. They are the flailing vines. You’re supposed to be able to right click on the vine and then wrestle it into submission using the vehicle UI that pops up. However, it’s not working. Nothing happens when you push the buttons. So if you have a wild plant you’ll just have to wait, like me, until it’s fixed. Hopefully in the next patch. Once you’ve cleared whatever your problem with the plant was it’ll begin to grow. So far the only plants that I’ve harvested took 24 hours (ish) to mature. That may change and some of the other seeds may take longer. From the lists on MMO-Champion there are a LOT of really useful plants that you can grow. I was happy just for the help with cooking materials. But it seems there are plants that will produce just about every crafting material. And raising your rep with the tillers, individuals and the whole group, can earn you some cool items. Goat mounts, pets, free seeds, etc. Putting on my tin hat here. There’s a small pond behind the farmer in the picture. And one of the recipe rewards that you can get with Tillers reputation is “Spicy Salmon.” I wonder if we’re going to be raising fish in there?